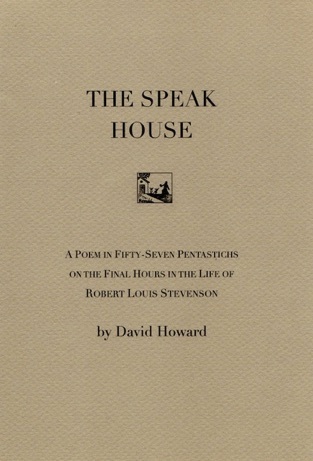 In The Speak House David Howard takes “the common phrase ‘my life flashed before my eyes’ as a signpost”, and creates a “feverish tumble of impressions” that might have occurred in the final two hours of Robert Louis Stevenson’s life, either just before or just after he lost consciousness. Howard’s The incomplete poems was published by Cold Hub Press in 2011. The Speak House was written while the poet was Robert Burns Fellow at the University of Otago, Dunedin, New Zealand, in 2013. The wave never regrets breaking. It was made to, and you and me . . .
its own way, the way of the echo. When we stop so does the road. all possibility of an house not made . . .
And then the wave, and then.